Research shows that although people can lose 5 to 10 percent of their body weight on any given diet, dieting itself is a consistent predictor of future weight gain. Why? At some point, everyone stops dieting. 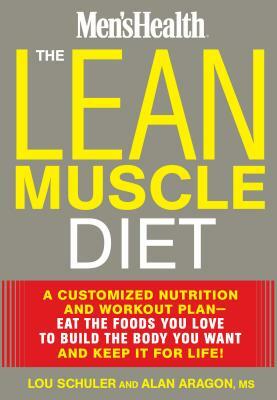 The Lean Muscle Diet solves the sustainability problem while offering immediate results. It's simple: act as if you already have the body you want. If a reader is, say, a 220-pound man who wants to become a muscular 180-pounder, he then uses The Lean Muscle Diet's formula to eat and train to sustain a 180-pound body. The transformation begins immediately, and the results last for life. Lou Schuler, who has sold more than one million copies of his fitness books worldwide, and Alan Aragon, nutrition advisor to Men's Health, have created an eating and "metabolically expensive" exercise plan designed to melt fat while building muscle. the best part? the plan allows readers to eat their favorite foods, no matter how decadent. with full support from Men's Health, The Lean Muscle Diet delivers a simple—and simply sustainable—body transformation plan anyone can use. Lou Schuler is a contributing editor of Men's Health magazine and the author of the New Rules for Lifting series. He lives in Allentown, Pa.
Alan Aragon is a nutrition consultant for Men's Health magazine and creator/editor of Alan Aragon's research review. He lives in San Diego.